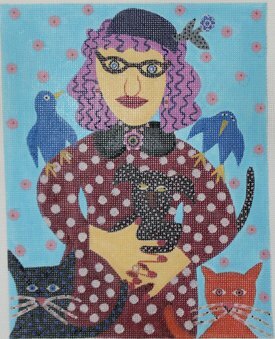 Surrounded needlepoint by Emily Owens from Maggie Co. featuring a whimsical woman surrounded by cats, dogs and birds with a blue background. This hand-painted contemporary needlepoint design measures 8" x 12" on 18 mesh canvas. The design comes with or without fibers. If you select cotton we will send DMC cotton floss. For wool we send Vineyard's merino wool; for silk we use Pepper pot fibers which are single stranded and easy to use. If you choose to add a little sparkle to your canvas, say on the dress or hat, just choose mixed threads and we will provide some Glisten by Rainbow Gallery or Kreinik braid. If you want to mount your canvas on stretcher bars to hold it taut while you stitch then we recommend purchasing a pair of 12" and a pair of 16" stretcher bars with thumb tacks. This handpainted needlepoint canvas usually ships within 1 week.